Thank you for visiting. DiluteOil.com strives to increase both understanding and accuracy in the calculations of blending essential oils, or as they are sometimes called Recipes. 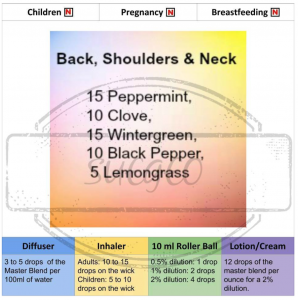 Our core feature is the The Essential Oil Dilution Calculator, located on the home page. We also have a second calculator, The MasterBlend Calculator, for use in calculating both the MasterBlend and the final dilution when used. There is also a page with detailed information on how the calculations are made, to what standard and whether it is important to have accurate calculations for your EO blends. We recommend starting with the "recipe" calculator on the home page. But, once comfortable with that, you should try out the MasterBlend calculator - handy for creating "bulk" blend bottles of your favorite blends. The following is a brief outline of the table of equivalents used on DiluteOil.com. For a full discussion on this Table of Equivalents; their source; and details on what Drops ("20") are please see our explanation here. The 3 Steps to Calculating the Individual Oil Ratios from a MasterBlend to a Diluted Blend for Application. 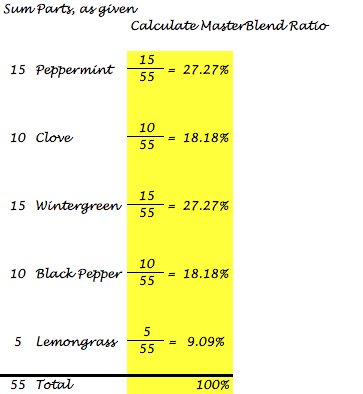 This post intends to provide an understanding of how to hand calculate Essential Oil MasterBlend ratios. These then can be used to determine if they meet the safety guidelines you, the user, have chosen. The calculations can be used, as is; or used as a foundation of understanding when using an on-line tool, such as DiluteOil.com’s comprehensive MasterBlend Calculator. These hand calculations will walk you through the steps to determine the ratios of oils from a MasterBlend through to actual usage when added to carrier oils. First, what is a MasterBlend? Simply put, it is a pre-mixed blend of essential oils, which are stored as a MasterBlend, awaiting further dilution with a carrier oil, as needed. This allows for larger, complex blends to be created, that are then used sparingly to create the final dilution for application. The example used in this post will create a MasterBlend that is 55 drops of essential oil. But, the recommended usage is only 4 drops in a 10mL roller ball. The remaining 51 drops would be saved undiluted, until the next rollerball is needed to be blended. Why worry about these calculations? There are a wide variety of sources for essential oil safety information. DiluteOil.com does NOT provide specific safety guidelines; but we DO provide accurate calculations that you can use compare the safety source(s) you choose. There are a wide variety of sources for suggested essential oil uses and blends/recipes of mixtures. But, when it comes to comparing the suggested blends with the suggested safety guidelines, there is often no direct information and it is up to YOU to calculate the safety ratios – especially for the individual components of a MasterBlend. To clarify, the term “MasterBlend” used here refers to the total combined essential oil blend/recipe, without any carrier oil. The term “Diluted Blend”, refers to the blending of a portion of theMasterBlend with a carrier oil, to create the application oil for use. With this as introduction, the process of calculations, is simple (but very repetitive). There are only 3 steps. Now that you have the dilution ratio of the individual oils you can compare the fully Diluted Blend’s individual oils to the safety profiles that you have researched and chosen to use. 1 drop in 20 teaspoons! 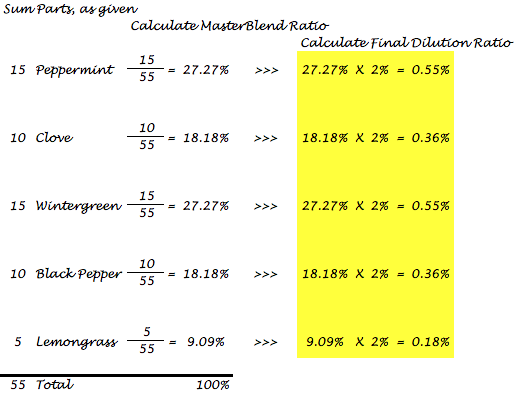 Now that you know how MasterBlends and their individual oils are calculated in Diluted Blends, you can calculate these ratios yourself and understand the math that goes on behind our MasterBlend Calculator. For information on safety ratios for essential oils, we recommend becoming a member of a reliable Facebook group and acquire reliable research based safety information such as Essential Oil Safety, 2nd Edition by Robert Tisserand and Rodney Young. 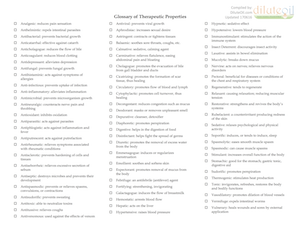 The Glossary of Therapeutic Properties has been updated. Click the thumbnail to open PDF. Enjoy! 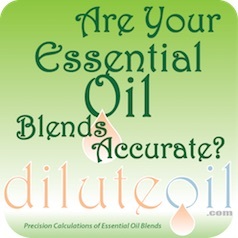 As of 6/6/17 DiluteOil has reverted all our essential oil calculators to only perform blend ratios. This includes the Basic, MasterBlend and the newly released “By Grams” (mass based calculator). Recently, we made changes to the DiluteOil website that were meant to add helpful information concerning the dilution ratios that you, our users, were calculating. This included adding some basic safety information concerning max dermal limits and phototoxity. But, the result was that we moved away from our core purpose of increasing both the understanding and accuracy of blending essential oils. Safety in very important in essential oils, and you are encouraged to investigate and determine what the safe dilution ratios are for your oils, needs and physiology. To do so properly is beyond the scope of this website. We welcome your continued use of DiluteOil.com for the purpose of knowing the blend ratios you determine you need, are correctly calculated to produce the blend you desire. Please share us with a friend! These first two items are based solely on mathematical principles misapplied when calculating essential oil blend ratios. The first typically causes your actual ratio to be less than you have wrongly calculated (think reduced potency); but on rare occasion will increase the ratio, as explained. The second will always cause your actual ratio to be less than your wrongly calculated ratio. Time and again, essential oil literature, books and websites will portray that 1 fluid ounce = 30 milliliters. This is simply not true. According to the NIST(1), the governing body in the U.S. for weights and measures, 1 fluid ounce = 29.57353 milliliters. This error only applies with calculations that use a mixture of metric and U.S. (customary) measurements, such as ounce, teaspoon, tablespoon, cup, etc. This also may apply when “drop” charts are used – which will be described in #3, below. In fairness to much of the literature and websites, there is often a disclosure of this difference, but excuses the variance in some form of expression, such as “close enough for ease of remembrance purposes”. What is the impact of this assumption? 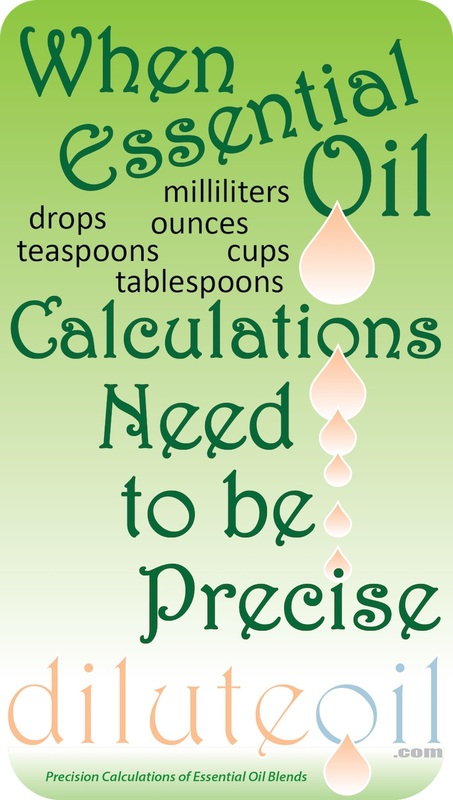 If your ratio uses essential oils in milliliters or “drops” and carrier oil in ounces, teaspoons, tablespoons or cups, then your dilution percentage will be LESS than you calculated – this is the most common. But, if your ratio is based on your essential oil being in ounces, teaspoons, tablespoons or cups and your carrier oil is in milliliters, then your ratio will be MORE than you calculated. How to overcome this error: Use 1 fluid ounce = 29.57353 milliliters for calculations. The second common error in essential oil “recipes, blends and drop charts” is a basic math error. Often a blend is presented as a ratio of the essential oil (EO) divided by the carrier oil (CO). i.e. “divide your 1mL of EO by your 10mL of CO to get your 10% blend” – a common ratio used for roller ball blends. How to overcome this error: Use the Total of both Essential Oils and Carrier Oils as the Divisor in calculations. Understand that there is no regulated, standardized definition of what a “drop” is, as a quantity of measurement. You will not find it in NIST’s Handbook 44(1), or that of any other governing authority. The reason is the forces that creates a drop of liquid and its size from a pippet, eyedropper, dropper-insert, or euro-dropper are dependent upon two primary factors – 1) the orifice size of the dropper, and 2) the cohesion/surface tension of the essential oil. Generally, aromatherapists dispense their essential oils using the dropper-insert, adhering to the theory that 20 drops is equivalent to 1 ml. This article determines that this is very seldom, if ever, the case. In Robert Tisserand’s Essential Oil Safety, (3) there is a footnote to Table 4.6 Calculating essential oil concentrations, citing Svoboda, he states in part (referring to how table 4.6) “These figures are averages, as the number of drops per ml can vary from 20 to 40, according to the type of dropper used.” This range is borne by the table in Svoboda’s article showing measured milliliters per 20 drops, in a laboratory test using seven different supplier’s dropper inserts and 12 different essential oils, along with distilled water as a control test. The full range listed here is accounted for by both the orifice size of the dropper AND the variety of the different oils. The orifice, or opening, in the dropper has a great impact on the volume of a drop of liquid. The larger the opening, the bigger the drop and therefore more volume. The third test of the Svoboda article was to “assess the volume of twenty drops of various oils using a range of seven dropper-types”. The oils used were Basil, Benzoin Resin, Cardamom, Frankincense, Laurel Leaf, Lavender, Rose (Harrop), Rosemary, Sweet Orange, Thyme, Vetiver; as well as distilled water for a control. Seven different droppers, all processing 11 different oils. Related to Dropper Size, the control test of distilled water, the seven droppers ranged between 14.49 – 22.73 drops per milliliter. That is a 22% variance. The variances, within the tests for individual oils, between the seven droppers ranged from 9% – 40%. How to overcome this error: Use Only Standardized Measurements and Equipment for calculations – milliliters, ounces, teaspoons, tablespoons, cups, etc. Avoid using “drops”. The other outcome of the Svoboda tests is to recognize that different essential oils have different characteristics that impact drop size. These are cohesion, surface tension, viscosity, and others. While a deeper study of chemistry is necessary to understand these characteristics, the net effect is evident in that with the exact same size orifice, different oils will produce a differing amount of volume (as measured in milliliters, etc) per the same number of drops. Literally, the “drops” are different sizes. In the Svoboda tests, 20 drops of essential oils measured from 0.52mL (Cardamom) to 0.77mL (Basil), demonstrating that a drop of Basil is more volume of oil than a drop of Cardamom. Notice that NONE of the sample oils approached the 20 drops per milliliter “standard”. Of the 77 tests (11 oils x 7 droppers), only 6 reached the level of 20 drops per milliliter. Another example of acknowledging differing drop sizes per milliliter can be found at the website for The Ananda Apothecary(4). While not knowing specifics about their dropper used, the 123 oils, range from 25 drops/ml for Rosemary to 52 drops/ml for Fir Needle. This is a 48% – 208% variance. After having read this far, and gaining an understanding of why using drops in calculations is not recommended, you may still choose to use drops charts, as in the illustration. Just one simple word of warning. Approximately 2/3 of drop charts in books and on the internet, are provided in 20 drops = 1 milliliter. The other 1/3 are 30 drops = 1 milliliter. Be certain you are using the correct chart for your “drop” size. 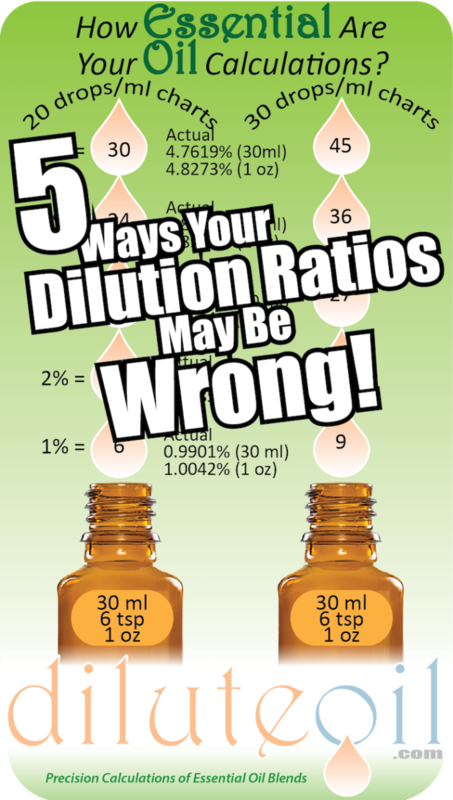 As you can see from the illustration, if you look at a 30-drop dilution chart and then use a dropper providing 20 drops, you will have a result with a 50% increase – your expected 2% blend will be a 3%. Not so bad, but what about your 10% blend becoming a 15% blend. And the inverse is true. If you use a 20-drop chart dilution chart and then use a dropper providing 30 drops, you will have a result with a -33% decrease – your expected 3% blend will be a 2%. That 10% example actually computes to 6.67%. The blend is -33% less effective. In addition to recommended safety levels for the dilution percentage of your overall blend, certain oils are recommended to be used at even lower dilution rates. For example, Cinnamon Bark, is generally recommended by Tisserand in his book(3) and in a survey(5) of several essential oil suppliers to have a max dilution of 0.07%. But, how do you compute when the blend looks like this? This gives a nice tidy ~3% blend, overall. But, the Cinnamon Bark component is 0.081% – over the recommended 0.07% maximum. Unless you take the time to compute the individual oils with lower dilution recommendations, you have made a blend with too high a dilution rate. A simple adjustment will give a safer dilution, when we substitute milliliters. In this example, the Cinnamon Bark is lowered to the safe level; the essential oils remain in the same proportions; and, the overall blend dilution is only lowered from ~3.0% to ~2.5%. There are a few simple steps to correct all these issues, and get precise calculations and reproducible results. Do not use drops as a measurement, or the corresponding drop charts. Confirm which equivalent of drops per milliliter the author uses. DISCLAIMER: This website is for Information Purposes Only and does not provide medical advice. DISCLAIMER: This website receives no monetary or product-in-kind compensation for references to products, sources or people.